Our WeldCraftpro® training programme is a unique, specialist welder-diver training course (underwater and topside) available via approved training providers, delivered through our 'centre-lead/self-run' teaching programme. The programme is approved by Americian Bureau of Shipping (ABS) Maritime Academy and comes with a certificate of verified achievement issued by EAL. EAL is part of SEMTA - Sector Skills Council for Science, Engineering and Manufacturing Technologies and is the UK’s leading awarding-body for engineering qualifications. This certification provides independent, quality assured, audited controls for the WeldCraft-Pro® training programme, thus making it the only externally awarded underwater welding training programme to issue internationally recognised/verified qualifications anywhere in the world. More information about EAL and SEMTA can be found here. The programme is also recognised by The Institute of Marine Engineering, Science and Technology. The training course is based on an 80 hour work programme, split over two phases (dry and wet). The course is open to both non-welders and welders alike and follows the guidelines for The European Welding Federation (EWF) syllabus 570-01 for fillet welder - plate (see course syllabus for full details). If you are a training provider wishing to adopt this accredited centre lead/self-run programme, please read on. If you are a diver interested in underwater welder training, see our course brochure and syllabus, You can also learn more below. See the list of approved training centres to find your nearest location. The WeldCraft-Pro® uses a well proven, detailed documented methodology to teach, utilising our professional teaching materials, expertise and accreditation, but using your own approved instructor(s). This allows you to run a recognised verified welding programme, using approved teaching materials, delivered at your school, using your staff, This will allow you to issue internationally recognised certification, under our approved Test Centre status. Any training provider wishing to make an initial enquiry about this course, we would ask you to fill out the application form and return this to us and we will be pleased to provide a copy of the course briefing notes and fee structure. Obstacles to the delivery of the course are kept to a minimum, but an initial application is required to be completed. If acceptable, this is followed by a site audit to ensure the necessary facilities, equipment and staff are in place. This will also include a briefing of your key staff in the use and delivery of the materials and familiarisation of all QA documents and procedures involved. Please note instructor and office administrator training is required prior to approval. (This initial visit is offered on a no-labour charge basis, excluding all travel costs (rules apply). Following a successful site visit and instructor training, an invitation to proceed will be offered, or details provided of any areas which might need improving. A licence agreement will then be signed in order to proceed, followed by delivery of all teaching materials. If you are interested in underwater welding read on. Learning to weld underwater has never been easier and NO you don't have to be a skilled welder to benefit from our training. Although underwater ‘wet-stick’ welding is manual metal arc (MMA) welding, we can teach you the skills more quickly and effectively, as the techniques used are far less involved than with conventional dry (MMA) welding. A unique, specialised training programme, designed for commercial divers serious about obtaining high quality MMA welding skills both above and below water. The course follows the guidelines as stated under the International Institute of Welding (IIW) and the European Welding Federation (EWF), with qualifications being awarded in accordance with BS EN ISO 15618-1, AWS D3.6M-10, or BS 4872-1 for fillet welds on plate. The training is designed to equip commercial divers with all the skills necessary to produce high quality fillet welds. Students will also cover all the relevant theory associated with the MMA welding process. Each specific topic is covered by a lecture where the learning outcome (LOC) is clearly identified. (These learning outcomes can be seen in the course syllabus). All qualified and/or experienced commercial sufrace supply divers/engineers working in the marine, shipping, construction and oil/gas industries with or without previous welding experience. Why not try our fun quiz to test your knowledge of underwater welding? 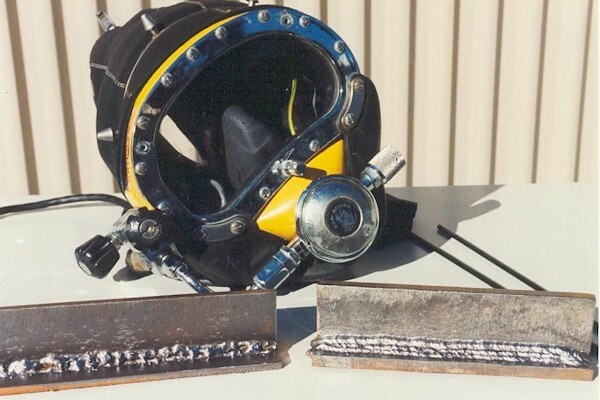 It is not a serious test but highlights some of the issues involved in underwater welding. Have a go!